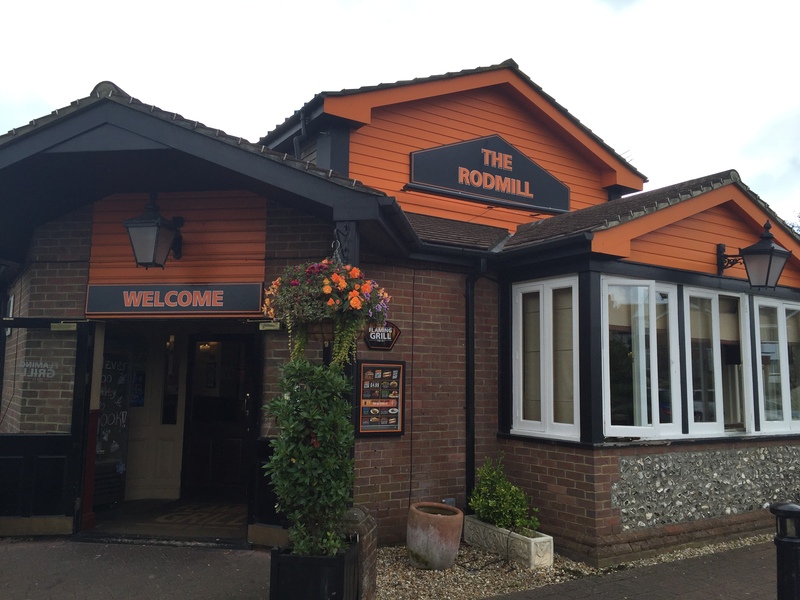 We aimed to head to a pub recommended in Ringmer, but could we find it! Trying to find a nice country pub is so hard to come by nowadays with some many shutting down or being replaced with chained establishments. We didn’t fancy a Harvester, Toby and Crown, we had eaten at these places countless times before and fancied a change. Then just opposite the hospital in Eastbourne, we came across the very ORANGE Flaming Grill pub/restaurant. Be careful though as driving in from the A27 you need to take a right beforehand. Otherwise, you need to go round the next roundabout and come back on yourself. The meals just all looked incredible! Ummm’ing and Arrrrrrr’ing at what to have, from the standard Fish ‘n’ Chips through to a Chicken and waffle burger. 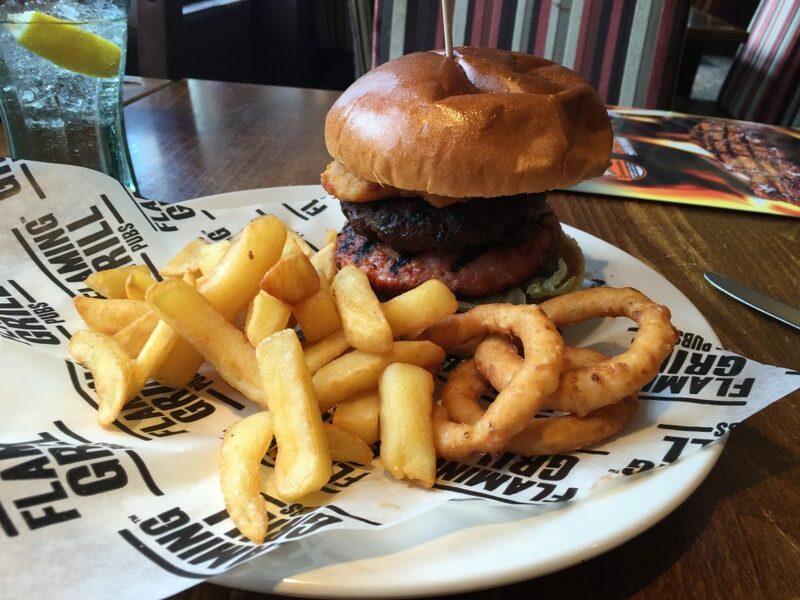 We decided to sample the sharing plater followed by a mixed grill burger for Lee and mixed grill for Tina. In all honesty not expecting much regarding food quality or quantity (ooooooooo how surprised we were). The plater came with enough food to feed a small family, well maybe not entirely but it certainly was enough food to have on its own between the two for lunch. However, having not eaten and already ordered the mains the right thing to just plough on through. It wasn’t long after the starter plates, yes plate(s)were taken, and the mains were here. 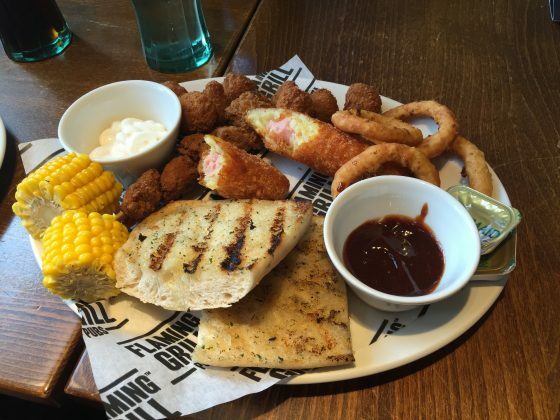 All you could hear was the sizzling hot plate that Tina’s mixed grill was perched on. Chicken, sausage, gammon steak and normal steak, a true meat lovers paradise. Lee’s, however, was a mountain of meat in a bun, 6oz burger, breaded chicken (seemed frozen) and a minced gammon burger (again seemed frozen). Although seemed frozen the gammon burger was quite nice not too salty, a bit charred but you couldn’t taste that. Then with the breaded chicken and a bit of mayo reminded me of the McChicken sandwich from the golden arches. The one thing Tina did say both a positive and a negative, was that the Gammon was a tad salty (and this comes from someone who loves more salt on her food). But the steak however and this I can vouch for, just melted in the mouth and was cooked to a perfect medium just as we asked. As much as we would have loved to have had some pudding. I must admit the Cookie pizza with ice cream looked to die for. We just didn’t have any room left for anything; not even the pudding stomach had any space against the space filled with the quantities we had just polished off. Next time pudding fans, next time!